This in-fill project for a retired couple features a compact single family residence with a detached garage apartment. As one of our custom home projects, we built this couple the home they desired from the ground up. 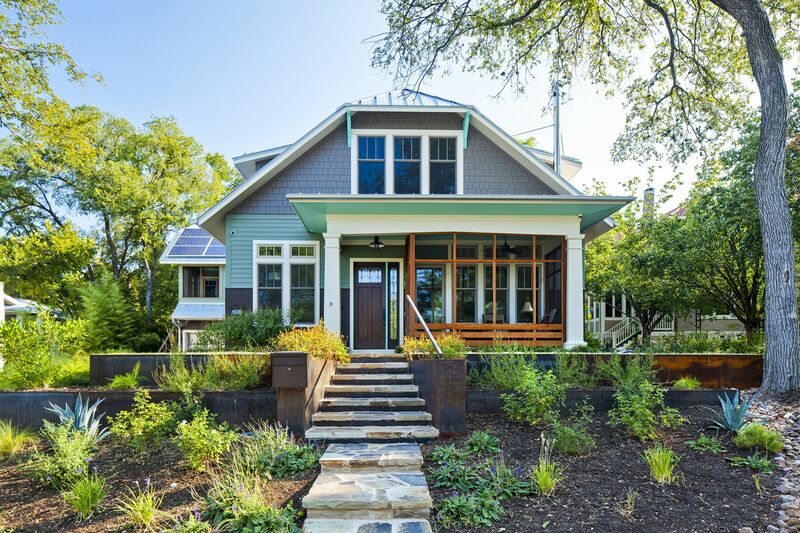 The result is a low maintenance, energy-efficient home in a Bungalow/Craftsman style that’s compatible with the varied but historic character of its North University neighborhood. one for the homeowners and a second for guests. The upstairs suite is intended for first occupancy by the owners—while both are mobile. The design takes advantage of the home’s view of the UT Tower and addresses privacy concerns with the street and adjacent neighbors. Additionally, several screened porches extend living outdoors. Two themes are reflected in the home design: the exterior is built in a traditional style that is both modern and fresh, while the interior features new technologies such as LED lighting, 7.2KW solar array, and a tankless water heater. Numerous energy saving items and convenience features are integrated into the home's design. Built-in cabinetry, including Murphy bed, office kitchenette, dog bowl station, dining room display cabinets and durable finishes throughout make this home both livable and sustainable. LED Cove lighting at main living areas and front porch. Exterior finishes include vertical metal siding, Hardi-plank and Hardi-shingle. that blends right in to the neighborhood’s historic style while still including sustainable features throughout. The couple can now continue to live independently in their new custom home.